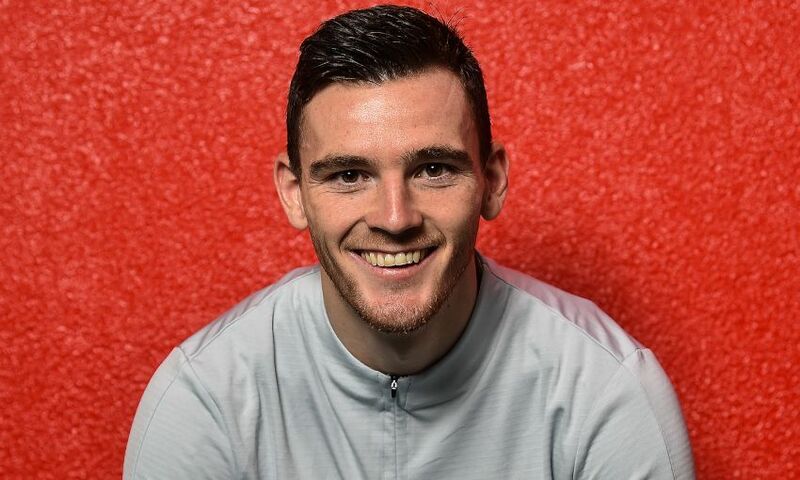 Andy Robertson today committed his future to Liverpool by signing a new long-term contract with the club – and immediately explained why it was one of the easiest decisions he's ever made. 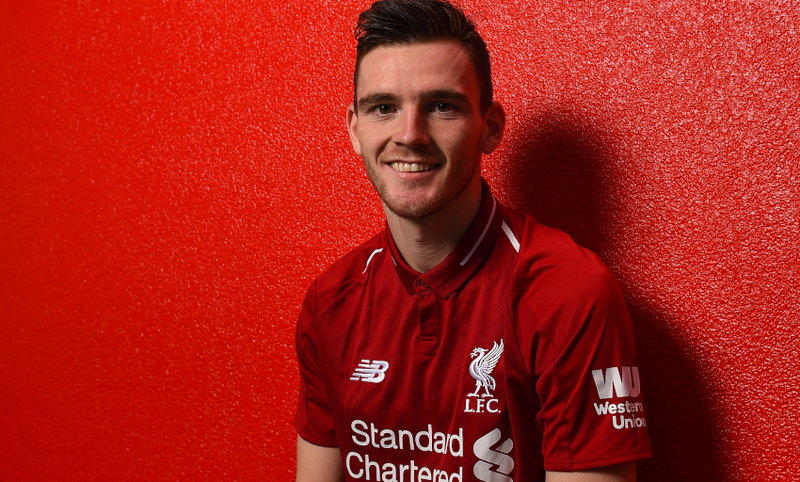 The full-back put pen to paper on the deal at Melwood on Thursday just 18 months after initially arriving from Hull City. 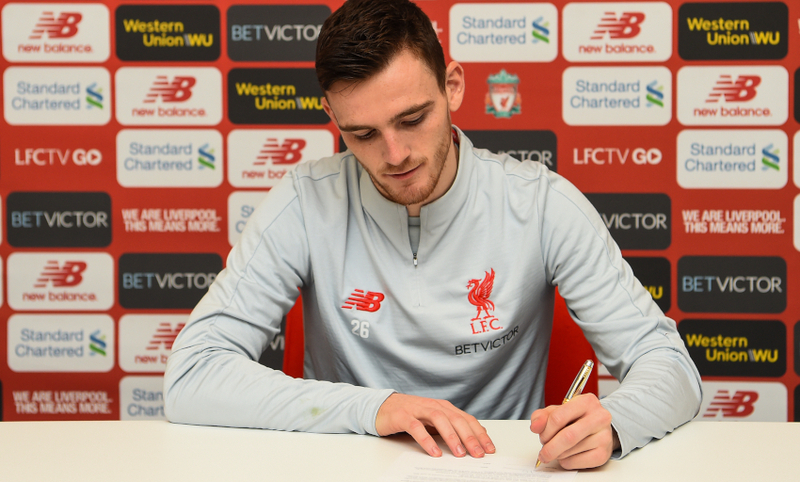 Moments after inking his new terms, Robertson sat down with Liverpoolfc.com at the Reds’ training complex to outline why he was so eager to complete the formalities as quickly as possible. The Scotland captain also reflected on a whirlwind first 18 months at the club, during which he’s established himself as a regular in Jürgen Klopp’s starting line-up and made 56 appearances to date, as well as detailing his aims for the future. Andy, congratulations on signing a new long-term deal with the club. How does it feel to have it done and dusted and to have committed your future here? I’m delighted. Obviously it takes time, but staying at this club is something I wanted to do. I’m glad to put pen to paper and hopefully there are a lot more successful years ahead at this club. Yeah, as soon as the club came to me, it was a no-brainer for me – I want to stay here, so as soon as they put an offer on the table it was signed as quickly as that. It was a pretty easy contract for me and I’m sure for the club as well. We both agreed very quickly, that’s why it’s been done so quickly. Now it is done, what are you feeling? As I said, delighted and over the moon. Since I came in the door, I obviously had a bit of a frustrating start, but I’ve loved every minute of it. Getting to know the lads and working with all the staff at Melwood has been a pleasure. The best thing about work is when you love coming in every day – and that’s what I do here. I am glad I have extended my stay and hopefully we have a lot of good days ahead. What kind of emotions have you gone through, from the beginning of the talks to now? I think this time I didn’t have the time to really have any emotions! Some can drag out and there can be a lot of emotions, but this one was fairly easy, so [my emotions] were ones of happiness that they wanted to offer me a new contract. As quickly as that, it was signed. Emotions have been very positive the whole way through it and when you sign it, it’s a bit of a relief that it’s signed and finally done. This has definitely been the best one I’ve negotiated and done; it’s been pretty stress-free, which is always a bonus. Get the new white colourway of the official 2018-19 New Balance training range at liverpoolfc.com/store from 9am GMT on January 18. It’s the second contract you’ve signed here. How are you a different player and person to the lad who walked through the doors at Melwood 18 months ago? When I walked in the door, it felt as if I had to kind of prove myself to everyone – all of the lads and all of the staff, more importantly, and the fans of course. Now I feel an established member of this squad and I think that’s the biggest difference – I feel comfortable in my surroundings, playing for such a massive club. I love playing with all of the lads and I hope they respect me as a player now. I’m sure they did at the time, but they probably didn’t know much about me, so it’s always nice to come in and prove yourself, see yourself progressing every day and I feel as if I am still improving. Yeah, I’ve probably been on a journey within a journey really, if you look at the last 18 months. After I got into the team, I did touch on that the first three months were hard because it was the first time I’d ever experienced that and it was something I had to deal with. Looking back on it, I certainly learned a lot from it, I took everything in without probably noticing that I was learning every single day. That’s what helped me to move in and take my chance when it came. From that moment, I’ve not really looked back. The journey we’ve all been on in the last 18 months – not just myself – has been incredible. We were close to a Champions League, which was disappointing but an incredible journey for us all. Now we sit where we are in the league, so hopefully the journey continues. The last 18 months I can look back upon with a lot of fond memories. You feel that initial period has made you a better player? Of course. It made me a better player probably more mentally, but also physically as well in terms of the demands of playing for Liverpool, how fit you need to be and how on your game you have to be every single game. That’s what, luckily, I’ve done. Mentally, it really set me up and helped me with the attitude and mentally towards playing for this big club. I feel as though I’ve dealt with it well since then. Would you say the boss has played a big role in your development? Yes, huge. I think he helps with the development of all the players. People come in as probably a lot more the finished article than what I did when I came in, but he still helps them in every single way. For me, he’s been different class since the moment I walked in. It was hard at the start, but it didn’t mean that he wasn’t talking to me or helping to improve me as a player. I believed my chance would come and I am sure so did he, so he was trying to get me best prepared for it. Our relationship has been good since the very start and hopefully it will last longer with the contract being signed! You mentioned it earlier, but the staff here too – how important have they been to you? There are so many of them, but you go around every single one of them and they’re all first class at what they do. Some of them get more credit than others of course, that’s the way football works, but the team behind the team as such is second to none. They’re the ones that get us fit and keep us playing every single game; if you have injuries or you’re coming back from injury, they get you fully fit. These are the people that don’t get the credit they deserve, but all of the players appreciate them so much and they’re what make this training ground so special to come into every day. Yeah, it’s not bad! In probably just over the space of the year, it’s all happened quite quickly but it’s all been so positive. The captaincy for Scotland was massive for me and something I was delighted with. Getting to the final of the Champions League is something I’ll always remember. As I said, it did end in disappointment, but it was an incredible journey. The title challenge is still ongoing, but it is something we hope we can look back upon with happiness – that’s still to be seen and there’s still a lot of hard work for that to happen. Over the last year or so, it’s been incredible for me and the stuff I’ve ticked off and done is really good. I am sure the day I retire and sit back to look at my career, that’ll be one of the biggest years of it. Things have changed a lot for you in the last 18 months off the field too, haven’t they? Yeah, it’s probably why my eyes are a wee bit heavier than they probably were when I walked through the door! I have two children and that’s probably my biggest achievement. I love my family – I am a big family person – so to bring two children into the world, there is no better feeling. I think me and my Mrs are doing quite a good job of bringing them up, especially her! It’s always nice to bring kids into the world and we’ve been lucky to do that. One is only a week old, so she won’t know much, but it’s an incredible feeling – there’s probably not quite another feeling like it. How has the sleep been in the last week? It’s been OK! It’s been up and down, but we’ve just been trying to grab our sleep when and if we can take it. There’ve probably been a few late mornings when we’ve slept in, but every parent knows it’s just about survival in the first couple of weeks! That’s what we’ve done; we’ve had a lot of help from our families, our parents, which always helps and means we can catch up on sleep. Of course, I need to be ready to play games and train at the highest level – and by doing that, sleep is so important. They’ve been a massive help to us. You’re part of a defence that’s conceded just 10 goals in the league so far this season. How pleased are you with the work that you and the team are doing in that regard? I think all of the defenders have spoken about it – we defend as an 11. Our front three are so important to the way we defend and if they don’t press to start then our defending doesn’t really work. They work so hard and the midfield do some shift in there, they cover all the ground and maybe don’t get the credit they deserve. The defence has been highlighted this season, of course, and for the goalkeeper to only concede 10 goals is incredible. We need to make sure we keep that going because if you keep a clean sheet then at least you’re not going to get beat, that’s for sure, so that’s the attitude we’ve taken this season. You’ve probably seen a different team when we’ve gone 1-0 up and look comfortable in defence; we feel as if we can defend leads now, that’s probably one of the main keys – our mentality towards defending and keeping clean sheets has been second to none. That’s why we’ve probably kept so many this season. Virgil van Dijk told us recently it’s important the praise for such records is shared out among the team. It is a collective effort, isn’t it? Of course. But he is also the first to say that he will probably take the flak if the defence starts doing badly, just because of his stature and his transfer fee and stuff, so I think it’s a fair point. He is a great player and is very much about sharing the credit and stuff like that. I am sure he gets a lot of praise, but when he gets the chance to praise others he always does it and that’s why he’s one of the best. He is getting better as well, he is somebody that is improving and you can see him improving every day. People might think he is the finished article, but I think he’s still got a lot to give and I’m sure he’d agree with that. Do you feel personally there’s more to come from you? Every day that I come into training I feel as if I am improving on something. I am still young enough at 24 that I hope my best is still to come, that I can get better at the things that maybe are a small weakness or whatever. It’s about improving on them every day and the things you think are strengths, to try to get better at. I feel as if I have done that – this season I have already got more assists than last season, which is massive for me because I wanted to give more in attack and make my final ball a bit better. This season I feel it has been better, but it can still improve. As a defence we’ve improved and of course, defensively, I feel as if I have improved under that. I am happy with that side of the game as well, getting better and better and I hope there is still a lot more to come. Speaking of assists, how is the competition going with Trent? It’s going good from my perspective! It’s been put on pause unfortunately for the next couple of weeks because we’ve obviously lost him to injury, which is a massive disappointment. He is somebody that has got the attitude to get back as quickly as possible, as quickly as his body allows him, so I am sure we will see him back on the park again soon and we can start that competition again. I just want him to get back fit and back playing because he is a massive part of this squad and will be a big miss, but we’ve got people who will fill the gap for these games and I am sure they will do it well. There’s a genuine bond among the players here. How significant has that been in terms of allowing the team to develop? It’s been huge. 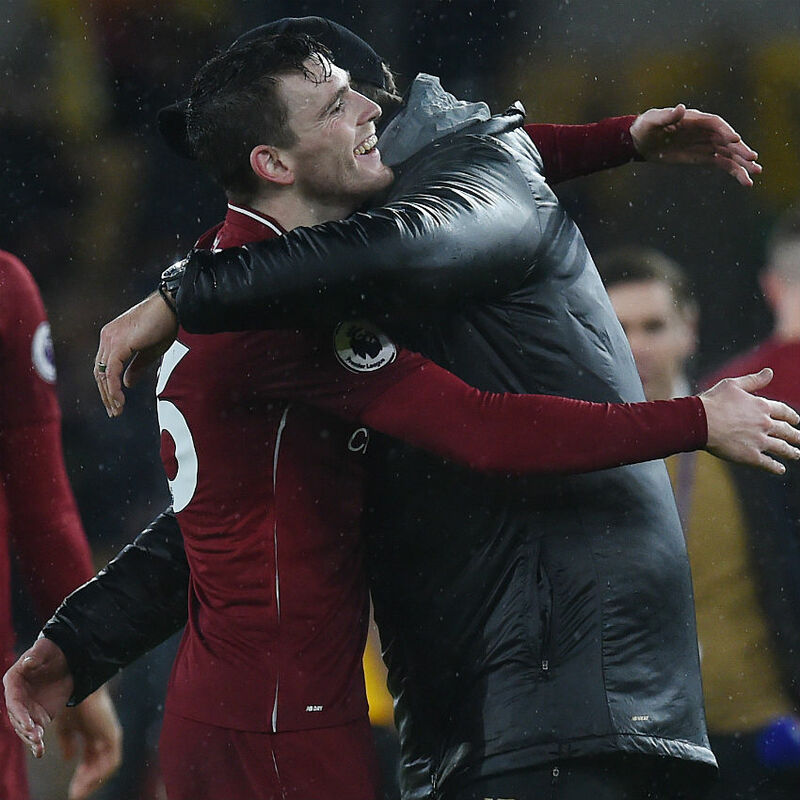 When you walk into the dressing room, you see that it is genuine closeness – it’s not put on as a front or whatever, it’s lads who enjoy playing with each other and enjoy spending time with each other. We spend a lot of time together, whether it’s in hotels or in training every day – sometimes you see players more than your families, so they’re probably your second family! We are all really close and that helps on the pitch. Off the pitch, we’ve been quite lucky that things haven’t went wrong, but when things do then we all pull together and all push in the right direction. That can only be a benefit to this club. You’ve built quite a rapport with the supporters. What does that mean to you? They’re massive as to what this club relies on, as such. They sell out every single game and make a great noise for all of the players. All the players have a really good relationship with the fans. It always helps when you’re winning games, of course it does – all fans are happy when you’re winning and luckily we’ve won our fair share of games this season and the fans have been excellent. Home and away, they follow us all around the country so credit to all of them and hopefully we can keep giving them something to celebrate about. That’s our main aim because if the fans are happy then we’re doing something right. I obviously hear the songs. It’s always nice [to hear]. When the fans sing any of the lads’ names, I am sure it gives them all a lift because if they appreciate you then it is the best feeling. They’ve sang my song a few times and it is nice to hear it. It can give you a lift in the game. A lot more of the lads are getting songs now and they’re all getting appreciated. It was one of the big things for Virgil, I think – to get a song. He is delighted, I heard him singing it in the changing room a couple of days ago – he loves it! It helps all of the lads, of course. I’ve not really seen the memes, but I am sure there are a few kicking about. A couple of my pals have sent me them, it’s probably just me acting daft. Ah well, then – there you go! I always try to run and my attitude towards games is to give 100 per cent. I might not be at my best in games, but I will always give my all. It’s what I try to do every single game. What are you hoping to achieve over the course of this new deal? I hope to achieve success as a team. This club demands trophies and too long has probably passed without trophies. I hope to bring another couple of trophies to this club and help push in that direction because the fans demand it and the club demands it, so that’s what we aim to give. We came close, of course we have with the Champions League and things like that, but it’s about taking that next step and hopefully getting a winner’s medal around your neck, whatever competition it is. Whether we do it this season or next, or the one after that, it has to be the main aim for us. Lastly, we always like to ask players if they have a message for the supporters at this point, so what would yours be to them? I’d like to say to them thank you for your continued support for the team because, like I touched on, it’s a massive part for us that Anfield is sold out every single game, the away ends are always jam-packed in every game we play in. It gives us a lift, of course it does, when the fans are singing, getting behind the boys and making a great noise, especially at Anfield. It can lead us to victory – it has done this season. We’ve got a big run-in until the end of the season and we need everyone pulling in the right direction, especially the fans. They’ve been great so far and if they continue it then hopefully we can all be a part of something special.